Has your life spiralled out of control, and you can’t handle it any longer? 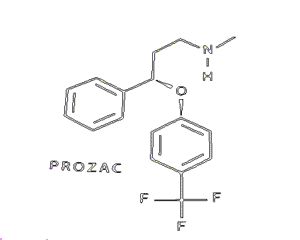 Do you feel “not right” to be dependant on antidepressants? Are you concerned about the side effects of these drugs? Depression can respond to acupuncture treatment. And according to a study from Beijing University of Chinese Medicine, you can expect some improvement within two weeks of starting your treatment. Even The World Health Organisation gives acupuncture a nod. It reports acupuncture to be an effective alternative in the treatment of depression. Would you be willing to discuss your situation with us? After one treatment I had very little expectations. To my surprise anxiety reduced by 90%, severe night sweats, and unpleasant dreams stopped. As an epileptic, I could not use usual antidepressant medication, as it can cause seizures. “Acupuncture began to work faster [than antidepressants], reducing symptoms more dramatically … than the drug did. 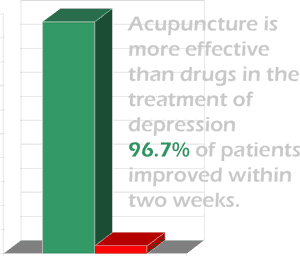 Effective: Research shows the effects of acupuncture are comparable to the conventional treatment of depression. Fast: it seems to outperform the drugs in terms of when you get a response. Targeted: At our clinic, we customise Acupuncture treatment to your particular symptoms. We will address your specific psychological and physical symptoms like anxiety, lack of energy, appetite, insomnia or other. Holistic: Likely, you will notice the benefits not only specific to your condition but also general health benefits; such as improved immunity, better sleep, better concentration, increased performance and improved memory. You will feel more relaxed and satisfied with your life. Acupuncture treats the root of disease, not just symptoms. Not addictive: Acupuncture will cause not the smallest sign of addiction. Furthermore, research has shown acupuncture to treat opiate and other addictive substance dependence. If you are on an addictive medication, it will be easier to quit with the help of this time-tested therapy. Acupuncture in combination with antidepressant medications is both effective and works much sooner than antidepressants on their own. reference: Journal of Affective Disorders. Brain research revealed that acupuncture has a modulating and normalizing effect on the limbic-paralimbic-neocortical network (LPNN), including the default mode network. LPNN is related to sleep and emotions. This explains the improved qualities of life and sleep in depressed patients following acupuncture treatment. Acupuncture reduces inflammation. See this article on its effect on cytokines. A study from Beijing University of Chinese Medicine has shown you can expect some improvement in depression symptoms within two weeks from starting your acupuncture treatment. The effects of acupuncture for depression have been well documented. In 2002 WHO has published analysis and review of controlled clinical trials on acupuncture. We find the results to be really inspiring. Don’t just take our word for it, click here to read it. We can combine acupuncture with medications. Recent systematic review and meta-analysis has shown that acupuncture combined with antidepressant medication is effective, has an early onset of action, safe and well-tolerated. If you’re willing to stop your medication, we will not advise you to stop it once you have started acupuncture. You will gradually reduce it on the advice and with the supervision of your GP or psychiatrist as you start to feel healthier, more energetic, happier. Would you be willing to discuss your situation with us? Get in touch now!